Highly repetitive DNAs, often simple reiterations of AT-rich sequences, make up approx 20% of the D. melanogaster genome and therefore the bulk of heterochromatin (72). These can be separated by centrifugation through cesium gradients into four major satellite bands having buoyant densities distinct from main-band DNA (see Table 2). Satellite classes I, II, and IV each contain a predominant simple repeat sequence together with less abundant repeats distributed in large blocks on one or more chromosome arms (46). As examples, the AATAT repeat is especially abundant on the Y (approx 5.8 Mb, visible as four discrete blocks) and fourth (approx 2.7 Mb) chromosomes, is moderately represented on the X (approx 600 kb) and third (approx 630 kb) chromosomes, and is practically absent from chromosome 2 (46,61). 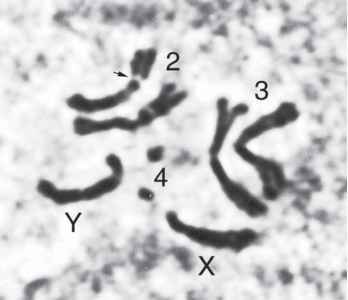 The AAGAG repeat is present on all chromosomes in different amounts: It is abundant on both the Y (approx 7.2 Mb) and chromosome 2 (approx 5.5 Mb, in mainly its right arm); it is present in smaller amounts on both the X (approx 1.2 Mb) and third (approx 1.1 Mb) chromosomes; and it represents a substantial portion of chromosome 4 (170 kb). The class III satellite consists mostly of a 359-bp AT-rich repeat (73) located almost entirely on the X chromosome (approx 11 Mb; 46). Dimers and trimers of this satellite behave as efficient scaffold-associated/attached regions (SARs) (79; for a review, see ref. 80), defined as DNA restriction fragments that bind strongly to histone-depleted "chromosomal scaffolds" extracted from nuclei. SARs (also referred to as matrix-associated regions [MARs]) are typically AT-rich sequences of several hundred basepairs and are cooperatively bound by DNA topoisomerase II (79). SARs have been found flanking a number of Drosophila genes, in some cases comapping with transcription enhancerlike sequences (81), and are postulated to define the sites where chromatin loops attach to an underlying scaffold or nuclear matrix (80). The observed cleavage of a 359-bp satellite by topoisomerase II may be important for satellite III condensation (79). Note: Satellite classifications are after Endow et al. (77). The buoyant density of main-band DNA is 1.701 (at peak). Information about the density, chromosome distribution, and genome percentage for the AT-rich satellites can be found in (refs. 46,61,72). Without exception, each specific satellite repeat listed maps to one or more heterochromatic sites (46,61). Repeat units 63-81% identical to the 359-bp satellite and usually in clusters of twoto four have been mapped to multiple euchromatic sites of the X chromosome (e.g., see ref. 78). DNA-binding proteins in single or multiple copies (84). AT-Hooks consist of approx nine amino acids centered around a highly conserved Gly-Arg-Pro core flanked by mostly basic residues that bind to AT-rich sequences through DNA minor groove contacts (83). D1 has 10 or 11 AT-hooks and must therefore have considerable affinity for AT-rich DNA. Indeed, immunostaining of mitotic chromosomes with anti-D1 antibodies shows a pattern that reflects the overall distribution of AT-rich satellites: The Y chromosome, the proximal part of the X, and chromosome 4 are all heavily stained; faint staining is observed on one arm of chromosome 3; and there is no detectable staining of chromosome 2 (85). Loss of zygotic D1 results in early lethality that is remarkable because the embryos appear to complete development normally but are unable to escape the eggshell. The proliferation disrupter (Prod) protein is concentrated at the pericentric regions of mitotic chromosomes 2 and 3 (86,87), mirroring the distribution of AATAACATAG satellite to which it can bind cooperatively (88). Prod is also found at much lower levels along all mitotic chromosome arms, and on poly-tene chromosomes it localizes to >400 euchromatic sites (86). Null prod mutants (obtained from heterozygous parents) are slow-growing late larval lethals whose brain cells show defects in both chromosome condensation and chroma-tid separation (86). The condensation problem can affect all chromosomes but is especially pronounced near the centromeres of the major autosomes, the same regions that in wild type show heavy accumulation of Prod. The transcription factor and chromatin protein GAGA factor (GAF) binds to the very abundant AAGAG satellite (as well as to other GA repeat-rich sequences; e.g., ref. 89) and shows heavy accumulation at known GA-rich sites in mitotic heterochromatin (87,90). In polytene nuclei, GAF binds hundreds of sites in euchromatin but is not detectable at the chromocenter (90), a pattern it shares with Prod (87). Assuming that the chromosomal distributions of GAF and Prod seen in polytene nuclei are magnified views of their distributions in diploid interphase nuclei (this is by no means certain), these observations suggest that during the mitotic cell cycle, there is a massive relocalization of GAF and Prod from heterochromatic to euchromatic sites and then back again (87). It is not known how such protein redistribution occurs or whether it is a cause or consequence of mitotic chromosome condensation. A self-assembly mechanism involving differences in affinities of protein-binding sites in euchromatin versus heterochromatin has been proposed by Platero and colleagues (87) to explain the apparent cyclical movements of these proteins. Cryptic satellites are highly repetitive DNAs with buoyant densities the same as main-band DNA. An example is the GC-rich dodeca satellite (48,76), which was cloned from a partial genomic library enriched for pericentric DNA fragments (76). Dodeca satellite-binding protein (DDP1) binds oligo-repeats of the pyrimidine-rich strand of dodeca satellite (91,92). The purine-rich strand of dodeca satellite is able to form very stable hairpin structures in vitro (93,94), which suggests how its pyrimidine-rich strand is made accessible to DDP1 in vivo. DDP1 also has significant binding affinity for the pyrimidine strand of the AAGAG repeat, the purine strand of which can also form foldback structures in vitro (92). The ability of DDP1 to bind at least two satellite repeats apparently explains why the protein distributes over a much wider region of the polytene chromocenter than is occupied by dodeca satellite alone (91). DDP1 also binds at several sites in polytene euchromatin bound by HP1 (91), although the functional significance of that colocalization is not known. DNA-binding compounds having particular affinity for the minor groove of AT-rich sequences have been known for many years (e.g., the fluorescent dye Hoechst 33258, the antibiotic distamycin). New compounds composed of multiple imidazole, pyrrole, and hydroxypyrrole units, called hairpin polyamides and based on the structure of distamycin, show not only high affinity for the minor groove but also high DNA sequence specificity (reviewed in ref. 95; also see ref. 96). Pairing rules for minor groove recognition by hairpin polyamides have been worked out by Dervan and collaborators and offer the potential that specific polyamides may be synthesized to target almost any DNA sequence of interest. Importantly for in vivo applications, small-molecule polyamides are soluble in aqueous solution, are not manifestly toxic, and can be tagged with fluorescent dyes. The most interesting properties of these polyamide compounds were observed after feeding them to developing flies of certain genotypes (98). The polyamide P9 that is specific for AT tracts was found to partially restore expression to the epigenetically silenced white eye-color gene when fed to the strain In(1)wm4. In this strain, an inversion of the X chromosome has moved the wildtype white gene (w+; necessary for eye pigment deposition) from its normal euchromatic location into heterochromatin. There, the condensed heterochro-matin prevents w+ from being expressed in some (or sometimes all) omma-tidial clones, resulting in patches of white against a wild-type red background. The general phenomenon is referred to as position-effect variegation (PEV). Janssen et al. (98) proposed that suppression of PEV by P9 results from its binding to AT tracts in X heterochromatin (and especially to the 359-bp repeat of satellite III), which, in turn, appears to stimulate chromatin unfolding and derepression of w+. A similar mechanism of suppression of wm4 variegation is proposed to be at work in the case of an artificial protein containing 20 AT-hook motifs, MATH20 (multi-AT-hook). MATH20 appears to outcompete and displace D1 from its binding sites in the 359-bp satellite repeat, causing condensed chromatin to open and w+ expression to occur (99). A more dramatic effect of polyamide treatment was observed when brown-dominant (bwD) flies were fed polyamide P31 that is specific for GAGAA repeats. These flies, but not wild type, showed developmental delay, high levels of lethality, and homeotic transformations similar to those seen in Trl13C mutants (the Trithorax-like gene encodes GAF). The basis of these deleterious effects lies in the peculiar nature of the bwD mutation, which is caused by insertion of approx 1.5 Mb of GAGAA repeat at the bw locus near the tip of the right arm of chromosome 2 (87). P31 binds to the bwD GAGAA satellite, apparently causing it to open and accept large quantities of GAF [bwD GAGAA does not normally bind GAF (87)]. Massive titration of GAF away from euchromatic sites to bwD is postulated to disrupt GAF-dependent gene expression on a large scale, leading to homeotic transformations and lethality. These polyamide feeding experiments recall studies by Pimpinelli and colleagues done some 25 yr earlier, in which larval brains in short-term culture were exposed to the minor groove-binder Hoechst 33258 (100). Although it lacks the sequence specificity (and apparent nontoxicity to wild type) of the polyamides used by Janssen and colleagues (98), Hoechst 33258 treatment was observed to cause striking region-specific decondensation of heterochromatin at locations of AT-rich satellites.